But for now, I still have a bento from the school year that I can share. By the pink box and background, this one was obviously for Faith. She had a stuffed muffin, although at this point, I have no idea what it was. From the color, it's likely chili, but there's a chance of taco as well. To the right is a mini cupcake, probably pink lemonade because I don't remember making any other mini cupcakes in recent months, strawberries, grapes and carrots. 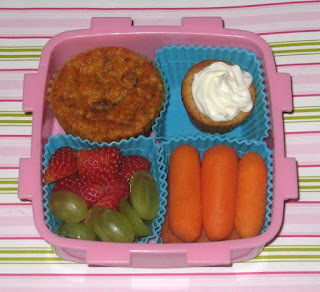 It's kind of weird because even a simple, non-embellished lunch looks so much nicer when it's all set out neatly in a box. I love all your muffin ideas. So inspiring!